I listened to the artist Janice Kerbel speak at The Whitney Museum last night as part of their Architectural Dialogues series. 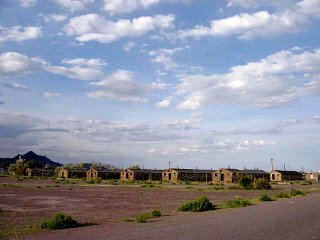 Kerbel is currently planning and mapping a ghost town community called 'Dead Star' for ghosts to inhabit during their retirement in the afterlife. I was so impressed by the extensive research that Kerbel does for each project with life cycles of plans, drawings, and intricate diagrams. Does the artist ultimately want any of her utopian plans to be realized? Essentially not – though she does provide a certain promise in the details and plausibility that she outlines. 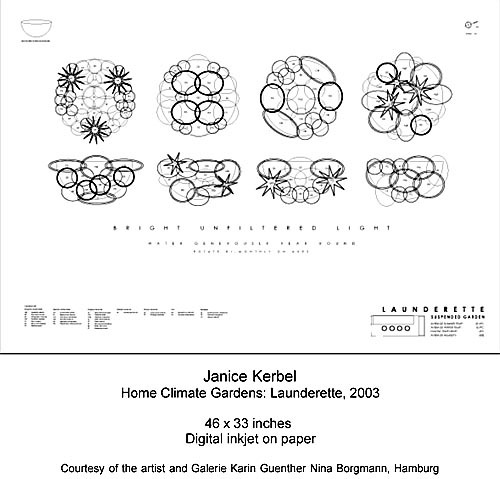 A favorite project of mine is Home Climate Gardens (2003) where Kerbel proposes ideal planting scenarios for various interior microclimate conditions - a community launderette (a suspended, air-filtering garden), an office space (an alpine garden tolerant to excessive air conditioning), a revolving restaurant (a 360 degree sun-drenched garden), and a council flat (a space-saving, wall-mounted garden). The Illustrator drawn diagrams for these projects essentially makes them feel attainable for the every man and perhaps even the mass market. 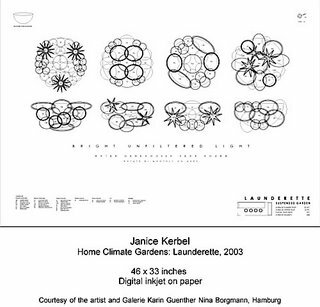 Janice Kerbel's 'Dead Star' project is on view at Moderna Museet until December 31, 2006.